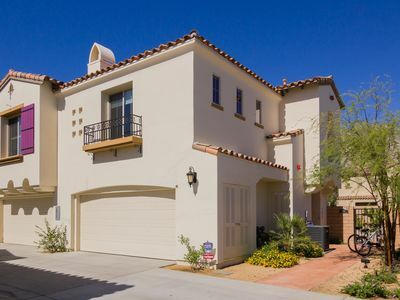 7Palms is a modern design, one story home, featuring an up to date kitchen with sleek baths, and a fabulous open concept layout that brings indoor living outside. 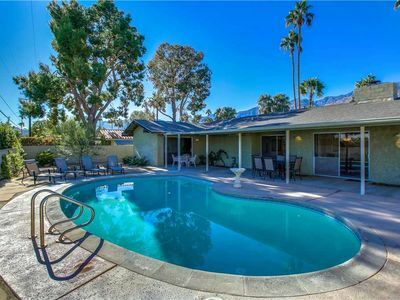 7Palms is tucked away on a quiet residential street in the wind free-zone known as the Tahquitz Creek Golf neighborhood, originally named “Green Fairway Estates” when developed in the 1950’s and 1960’s. 7Palms is about the 3 R’s. Relaxation, rest and romance. 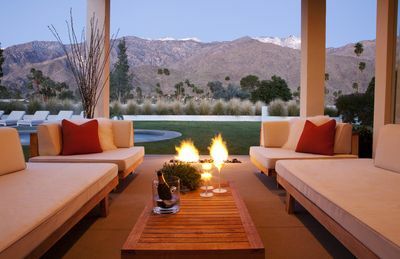 RELAXATION - The backyard with surrounding views of the mountains is designed for relaxation. 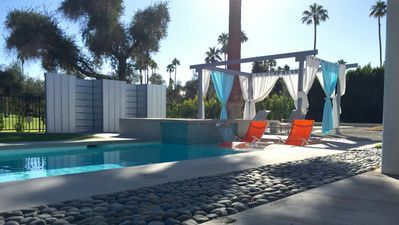 Sunbathe on the tanning shelf of your own private pool, read a book or entertain alfresco in the Gazebo, or just take it easy and unwind on one of the many chaise lounges surrounding the pool. For more lively entertainment, challenge friends and family to a game of Bocce Ball. The Bocce Ball court is regulation size (12’x65) and nestled amongst the citrus trees. If golf is your game, the backyard sits on the 4th tee box of the Legend Course, part of the desirable 36 hole Tahquitz Creek Golf Resort, named by Golf Digest “One of the Best Places to Play” for Golf Resorts. The Legend Course was designed by William Francis Bell, known for designing Torrey Pines, La Jolla Country Club and Bermuda Dunes Country Club. REST - A warm day spent in the backyard or on the course will require a little rest. Take a leisurely nap outdoors on the chaise lounge or sofa, or catch up on some restful sleep on the comfy king and queen sized beds. 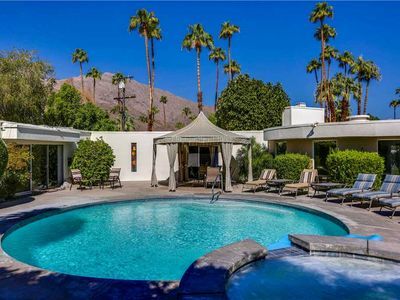 The front yard patio is private and fully enclosed with views of the San Jacinto Mountains and is the perfect place to nap or sip a cool drink while watching the sun set. If you prefer golf course vistas, the back yard covered patio offers unrestricted fairway views for several hundred yards. A dip in the heated spa relaxes tired bodies and helps you sleep soundly. ROMANCE - Romance is different things to different people. 7 Palms is ideally located and equipped to meet any desire. Want to cook and entertain at home? BBQ outdoors on the Weber grill or prepare a home cooked meal in the open kitchen featuring modern Viking and Bosch appliances. Want to watch your favorite television or sports programs? 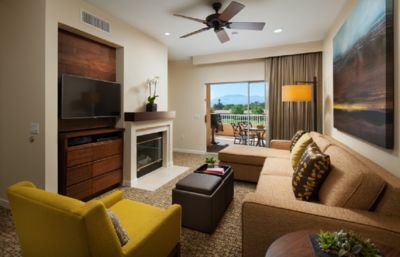 View HBO, Showtime and more on the large flat screen in the living room or in the Master Suite. Looking forward to a night out? Get yourself ready in the recently remodeled bathrooms with a tub/shower combination in the guest bath and walk in shower with a blue tooth enabled shower head in the Master en suite. 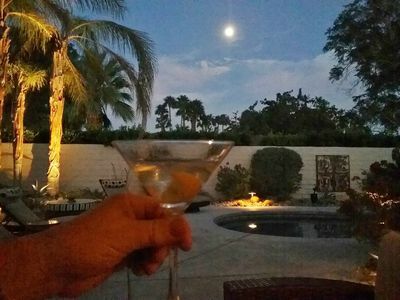 -For excellent Mexican fare, try San Miguel Restaurant on Date Palm in Cathedral City. 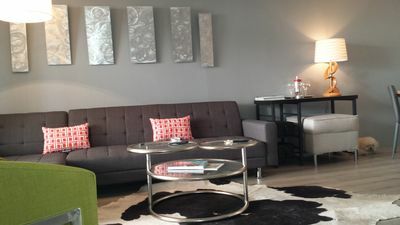 -Or take a chance on the many options nearby (Panera Bread, Dickey BBQ, Five Guys Burgers) all a 15 minute walk or 2 minute drive. -There is a trail head at the Vons shopping center, 200 yards from 7Palms. -The Indian Canyons and Tahquitz Canyon, both in Palm Springs, are protected areas open to hikers for a small fee. -Wet n’ Wild waterpark - a 2 minute drive. - Boomers for Miniature Golf, Go Karts - a 2 minute drive. -Tahquitz Creek Golf Resort offers 2 18 hole course. You can walk there, it's so close. -Indian Canyons Golf resort offer 2 18 hole courses is 5 minutes way. -Escena Golf is a Jack Nicklaus designed course is 5 minutes away. 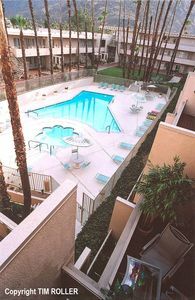 -The Palm Springs MOMA and Art +Design Center located in Palm Springs are free every Thursday, 4-8pm. 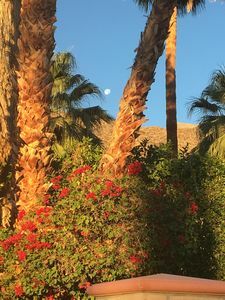 -The Living Desert located in Palm Desert. 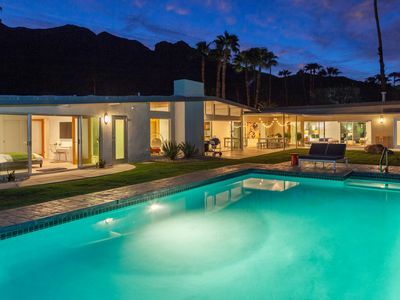 -The Annenberg Estate/Sunnylands located in Rancho Mirage. 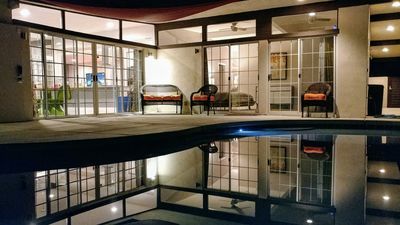 These are only a few of the many nearby things to do in the Greater Palm Springs Area. If you’re looking for something specific, please don't hesitate to ask us to help you find it! We update the calendar daily, so please check now for availability. We now accept credit card payments. Book directly via VRBO with confidence. We get many questions regarding return of security deposits. 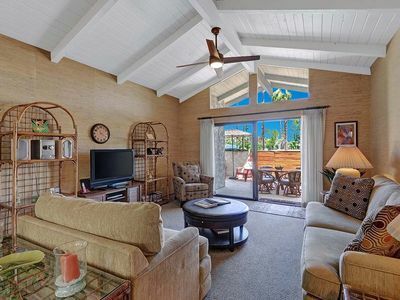 Deposits are often returned before our guests depart the property! Approximately 1/2 hour before your scheduled departure time, Cynthia or I will meet with you and do a walk through of the property. What we look for are broken or missing items, obvious signs of abuse, no dirty dishes in the kitchen, used towels and sheets are put into the bath tub, messes or clutter that require extra cleaning, etc. Basically we ask our guests to leave the house in a similar condition as when they arrived, but without the "polish". We'll take care of that. There is a complete list of departure items in the unit. If we don't note anything in the walk through, we will return your deposit to you before you leave! 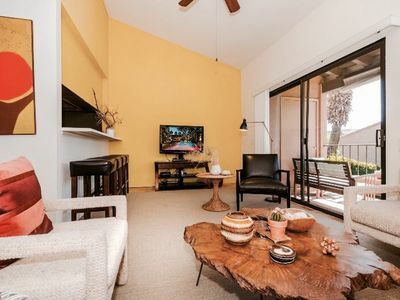 7Palms is a freshly renovated, fairway home and is priced competitively. We do not negotiate terms. Please note there are two security cameras on property, one facing the street from the front of the house, the other aimed at the pool equipment. 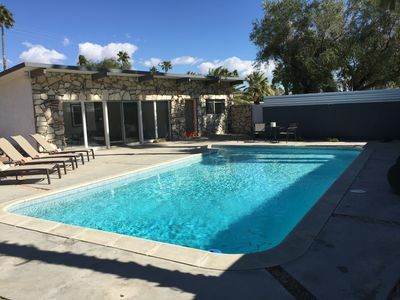 Quoted price includes pool/spa heating fee. 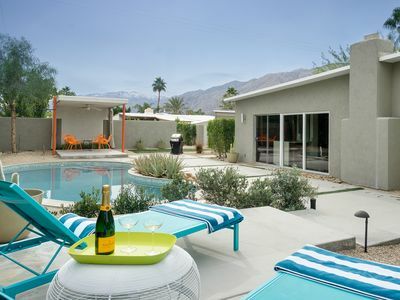 Come stay in this fabulous modern Palm Springs Alexander vacation home! 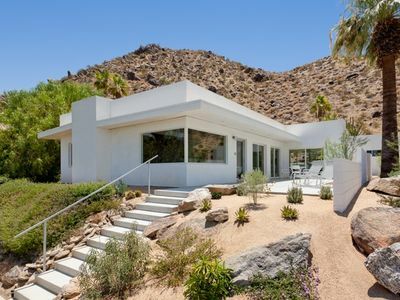 Modern Hillside Retreat++Private++Great Views++Wind-Protected ++Paradise!